Electric Inc. has successfully met the established requirements of the State of Texas Historically Utilized Business (HUB) certification and compliance program to be recognized as a "HUB." 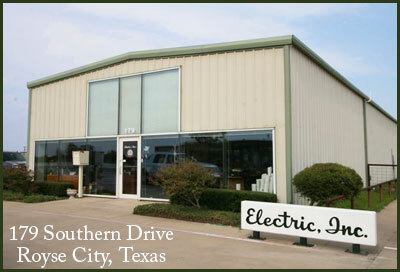 Electric, Inc. was established in 1973 for the purpose of providing commercial and industrial electrical work in Northeast Texas. Our wide range of experience includes commercial, industrial construction, office & retail space, banks, medical, high-tech, educational, industrial service, retail service, and voice/data cabling systems. Being centrally located and having a steady growth pattern Electric, Inc. is continually striving to better serve our clients. We service our customers with a fleet of trucks and electricians to man any size project. Having two master electricians on staff enables us to assist in the design of electrical systems. Our field staff is supported with project managers, estimators, dispatchers, expediters, and office clerks. We offer 24-hour on-call electrical service personnel for emergencies. Electric Inc. performs quality work to meet both local and NEC and OSHA requirements. Please add Electric, Inc. to your bidders list.